Professor Alan Dershowitz needs little introduction in legal circles. A preeminent civil-liberties and constitutional lawyer and recently-retired Professor of Law at Harvard Law School, he has also been described as “the best-known criminal lawyer in the world” after taking on a string of high-profile cases. Professor Dershowitz is currently in New Zealand, and last week gave a talk to a large audience at the University of Auckland Business School, sponsored by the law firm MinterEllisonRuddWatts along with the Raye Freedman Trust. In a Q&A session chaired by local constitutional law expert and former New Zealand Prime Minister, Sir Geoffrey Palmer, Professor Dershowitz covered a range of topics that included the US constitution and legal challenges to President Trump, current threats to free speech and the erosion of civil discourse between increasingly polarised political camps. “This country made a terrible mistake by voting for a United Nations resolution that said that the Western Wall of Jerusalem, the Hebrew University, the Hadassah Hospital, the Jewish Quarter [of the Old City of Jerusalem], were all illegally occupied territory”. 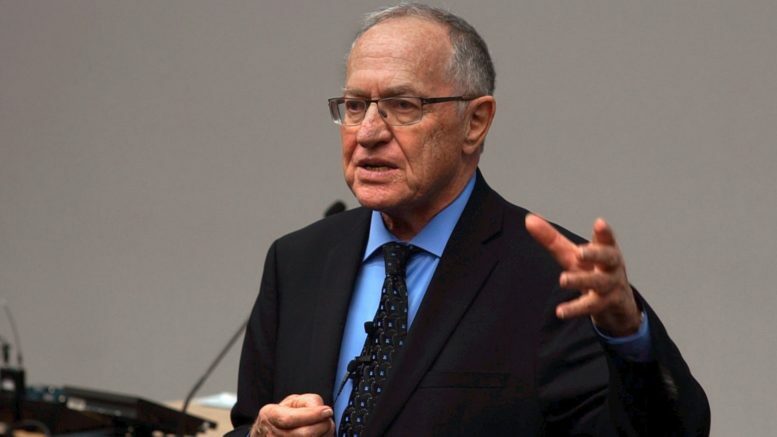 Professor Dershowitz characterised the US’s failure to exercise its veto as former President Barack Obama’s attempt to “get revenge on Binyamin Netanyahu”, which led directly to President Trump’s decision to recognise Jerusalem as Israel’s capital. “For me, discriminating against Israel or against only one country, the nation state of the Jewish people, Israeli academics, saying you won’t work with them – I don’t see how that’s different from the baker in the US who wouldn’t bake a cake for a gay couple, or a landowner who won’t rent to a black couple…it’s just wrong, it’s discrimination”. “BDS is not a protest against Israel’s policies, it is a protest against the very existence of Israel as the nation state of the Jewish people”. On the topic of Lorde’s cancellation of her Tel Aviv show as a result of pressure from local BDS activists, Professor Dershowitz said that, while he said he did not wish to criticise or condemn Lorde; “ I don’t think she had any idea of what she was doing. I think she ought to go to Israel to judge for herself”.